Building on our annual exhibition featuring the students of the Enowkin Centre we are pleased to introduce the work and art from an upcoming publication from Theytus Books. Theytus Books is the oldest Indigenous publishing house in Canada, and its catalogue is recognized and respected internationally for its contributions to Aboriginal literature. Since its inception in 1980, Theytus Books has been a leading proponent for Indigenous authors, illustrators and artists. It ensures that their voice and vision are expressed with the highest level of cultural authenticity and integrity. Theytus Books is proudly First Nations-owned and operated in partnership with the En'owkin Centre. In 2012, I embarked on a journey to learn Saulteaux- Anishinaabemowen and to revitalize the language for myself, our generation, our children and for genrations to come. The artwork are the illustrations for our book titled “Mayabbekamneeboon” which translates to “Blueberry Patch”. It was first told in Anishinabemowen and was later transcribed and translated into English. It is my Uncle Norman Chartrand’s childhood memory of the community packing up their horses and heading East of Duck Bay to pick blueberries for the month of July. It was through Uncle Norman’s story that I was able to reconnected with my mother, my grandmother, my granparents, great grandparents and the ancestors who continue to guide me on my journey. 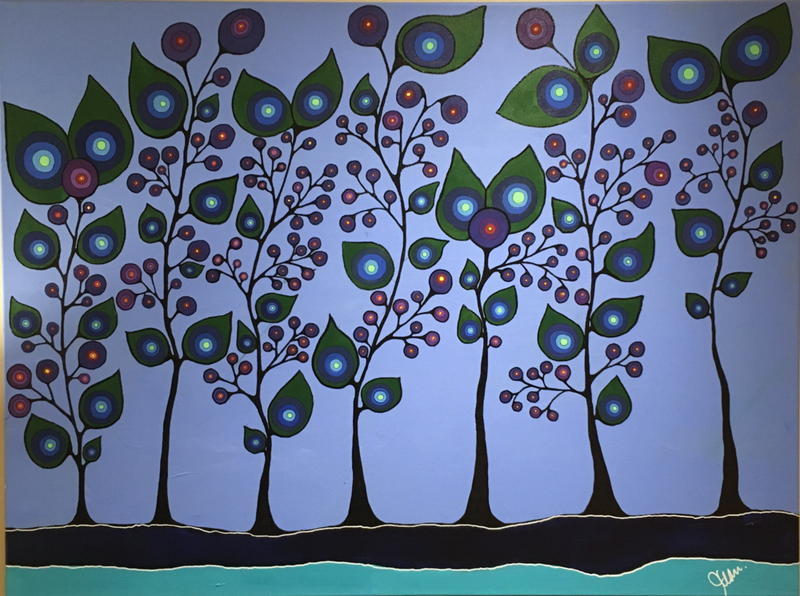 I truly believe they spoke to me through “spirit paint” (Norval Moriseau) and at times I felt their presence as they peered over my shoulder to tell which coloured they loved the most. This project has been about intergenerational healing, transforming my anger and grief into art, and seeing/feeling the love and beauty of each day. The art is a celebration of the ancestors; Indigneous identity; belief and belonging; colour and connection; self determination and definition; family and friendship; forgiveness and the future; land and language; persistence and patience; rest and reconciliation; sorrow and surrender; truth and time.